Nestled among the berry farms, tulip fields and waterfront communities of Washington State's Skagit Valley, Burlington plays host each fall to the Skagit Flats Marathon & Half Marathon, a fast and flat race event that takes runners on an out-and-back course through beautiful rural countryside. USATF-certified and a qualifying race for the Boston Marathon, the Skagit Flats races start and finish at Edison High School, and are run along rural roads through area farmland to the entrance of nearby Samish Island and back. Out on the course, don't be surprised if you spot birds of prey -- the Skagit Valley is reputedly one of the state's best viewing areas for the birds, from bald eagles to hawks to peregrine falcons, who migrate to the area each winter. Participants (the event is open to both runners and walkers) will have six hours to complete either the full or the half marathon, and race organizers say those who have not finished by 2:00 PM will "be responsible for their own safety," as roads along the race course will be re-opened after 2:00. Just over 670 runners and walkers crossed the finish line in both races combined in 2012, including 446 finishers in the half marathon alone. There will be 8 manned water stations, with 7 of them serving runners out and back (for a total of 15 stops for the entire marathon course). There will be an extra aid station near the end of the marathon course at mile 25.5 that will only be open on the return for marathoners. The stations will be manned by local cross country teams. Water, Gu Brew, pretzels, oranges, kettle chips, watermelon and Succeed S-Caps will be available at all stations. Gu Energy Gel will be available at aid stations 4 and 6 (marathon mile markers 6, 9.75, 16.25 and 20). We recommend that any personal items be stored in your vehicle. If you do not have a vehicle to store your personal items, contact a race volunteer. We will not be responsible for any lost or stolen items. All registrants will receive an IPICO timing chip that must be worn in order to be timed. NO CHIP NO TIME! The timing chip must be properly secured to either shoe. If the runner carries the timing chip in his/her hand, fanny pack, etc. the timing chip will not record a time. Fasten the timing chip with the tie-wrap provided securely to the shoe. Timing chips are non-transferable and must be worn only by the participant to whom it is assigned. Do not cross the finish line more than once. Start on Victoria Street just west of the gym and make a left on Norris street. Continue under I-5. At the stop sign take a right and then in about 1 mile take a right on Pulver. Go straight through the next stop sign at Josh Wilson and then make a left on Maiben. Right on Avon-Allen, then a left on Benson. The turn around for the half marathon is about 2 miles down Benson. 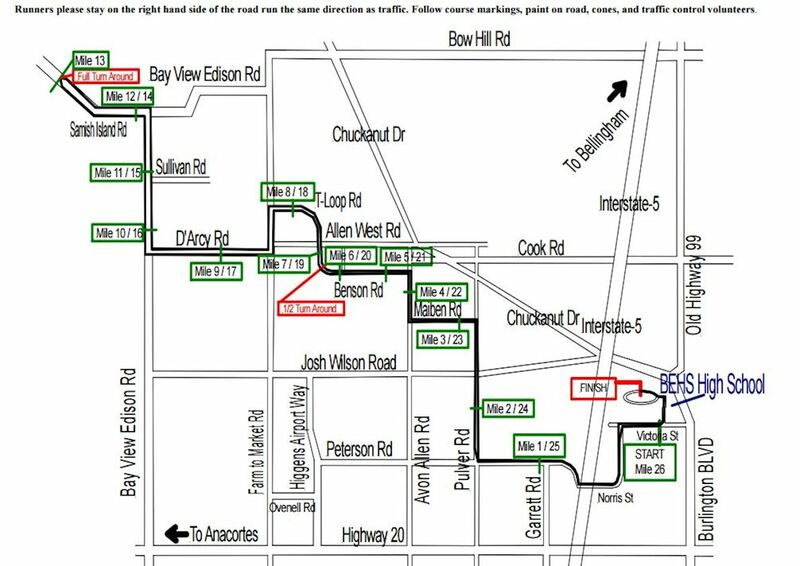 The marathon continues towards Samish Island via T-Loop Road, D’Arcy Road and Bay View-Edison Road. The turn around for the marathon is on Samish Island Road. After you turn around you will follow the course back the way you came. When you get back to the starting line, you will make a left and run between the gym and track and onto the track.